Hardly would you find a home without cutting tools for all kinds of purposes. Yes, they are that important! Starting from slicing bread, to cutting fruit for breakfast, shaving that overnight stubble or sharpening your gardening tools, or cutting wood – all these tasks get done a lot faster when your cutting tools are razor sharp. Hacking away ineffectually at a slab of meat with a blunt steak knife is one of the quickest ways to end up in a domestic accident situation with some of your fingers missing. 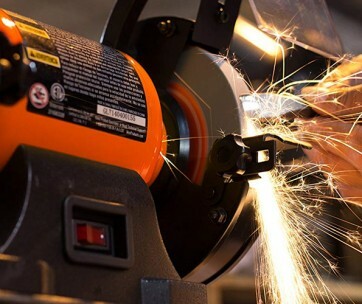 Great as it would be to have your cutting tools remain with their straight from the store sharpness, the reality is that they inevitably get dull over time, especially with continued use. That’s why we have made life a whole lot easier for you with this compilation of eight hacks to keep your cutting tools razor sharp and ready to cut cleanly through solid rock should it come to that. A sharpening tool is one of the fastest ways to get those blades back in the game before your fingers suffer any more damage. 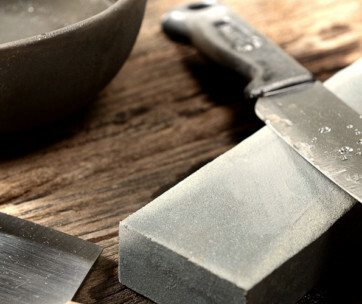 Whether you want to sharpen those dull bread knives in your kitchen or the hedge trimmers on your backyard, making use of a sharpening stone such as a Whetstone can come in very handy; this is often the go-to option of the plethora of sharpening tools out there. However, whichever sharpening tool you decide to go with, make sure to do first things first. Keep the blade to be sharpened clean and free of dirt using engine oil or kerosene for hard to remove residue. Finally, the time has come to sharpen your tool. If you are using a whetstone, do as the name suggests and wet that stone with some cooking oil. Water would work too, but oil lasts longer. Now pick up the knife and slide it across that whetstone in long, firm strokes. Slide it at an angle all the way up to the tip. But do not press the knife onto the stone – easy does it for this one. Slide at least ten times till the desired sharpness is reached. 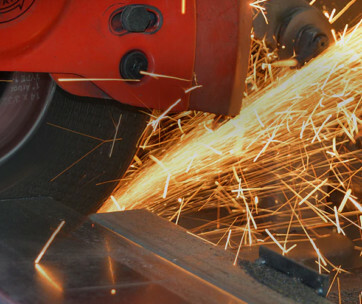 The best way to keep your cutting tools nice and sharp is for them not to get blunt or dull in the first place. As the saying goes, prevention is better than cure. The smarter you are in taking care of your knives and other sharp tools, the less likely you are to end up with dull tools. Maintenance is not always about keeping them safely sheathed in their store-bought condition or wrapping them using fancy packaging. Tools maintenance requires you to be much more proactive. Cleanliness is also key when it comes to maintenance. When done using your knives, pruning shears, spades, hoes, axes or any other tools, do not leave them lying around caked with sap, mud, and dirt. Wash them down thoroughly, using solvents such as a thinner or kerosene for sap removal and wipe dry. On occasion, give them an ‘oil massage’ with motor or penetrating oil. You can also fill up a small bucket with sand and stick the tools in there to keep them sharp. Still, on non-traditional methods of keeping your tools sharp, the coffee cup comes in handy for this one. Whether you are looking sharpen your electric chainsaws or those circular saws in your workshop, you don’t even need to leave your space at all when you run into a hitch chopping up those wood planks. Just drain that mug of your morning latte and flip it over on the counter. This only works with a ceramic mug. Your favorite “World’s Best Daddy’ plastic mug will not suffice in this case. Now get the knife – a washed and dried knife, that is. Stroke the flat edge of the knife across the bottom of the mug repeatedly. For a double-edged knife, repeat the process once one side is done. Look out for signs of wear or discoloration on the mug’s ring. If there is none, you are probably getting it all wrong. Mug discoloration is a sign of blade sharpening as some steel is being skimmed off. Who would have imagined that old mug could come in so handy? If you are game for non-traditional methods of sharpening cutting tools, then this next tip is for you. Remember that musty pile of old newspapers the missus has been harping on about tossing in the bin? Yes, that one – the ‘future reference’ you’ve been hoarding it for does not seem to be happening anytime soon. Might as well put them to good use for sharpening your knives. The household will be forever grateful to you. Simply take out a page from the newspaper especially, the pages with lots of black ink; black ink is quite gritty and perfect for sharpening. Now take out your cleaned knife and glide the sharp side of the knife across the paper, and remember to keep both the newspaper and knife flat. This method is particularly effective for non-serrated knives. Once done, make sure to wash the knife afterward though. Dinner with a dash of ink is not exactly mouthwatering cuisine. A flat file is a handy tool readily found in most men’s tool boxes. That thin piece of metal is capable of so much more than it is given credit for. Flat filing is very easy to use sharpening method that does not require a whole lot of skill. Simply run the flat file evenly and smoothly across the blade repeatedly till razor sharp. A flat file might not exactly be an easy thing to find for the executive man who just isn’t in the mood to make that drive to the hardware store. No worries though, your missus is going to save the day. A quick rummage in her nail polish toolbox should have you come up with a nail file. Unbelievable, huh? That delicate looking emery board Ms. Lady runs across her shapely nails has not even reached its full potential. Innocent as it looks, it is strong enough to bring a butcher knife back in commission. Buffing up a blade using sandpaper is pretty similar to the use of a flat file. Sandpaper is a good sharpening hack seeing how easy it is to find it. Even better, it is not particularly expensive to buy nor hard to use. Sandpaper with its gritty surface is perfect for buffing. Make sure to pick up enough pieces of it. Multipurpose as it is, it would come in handy for salvaging those milky looking headlamps you’ve been moving around with. This time though, it is your knife that needs to get acquainted with sandpaper. As recommended, sharpen only clean, mud and sap free cutting tools. Keep running the sandpaper over the edge of the blade for a well-honed tool. Sandpaper has the additional advantage of giving a shiny finish to the blade. Although it works best with flat blades, it would still give that serrated bread a nice edge to it. Your pruning shears or spade losing its edge? Worry no more, just get out the sandpaper and buff them up. Mothers were certainly on to something with the quick brush of the knife on the concrete floor mid cooking to sharpen up dull edges. You do not even need a trip to the hardware store for this one. This method works just as well with tiled floors. Even better, it does not give any marking on the tiling. Still not convinced? Leave the tiles out of it then and go out onto the driveway knife in hand. You might want to wrap it up in some newspaper or small cloth though before your neighbors decide Ted Bundy made a comeback and call the cops. Though your knife can’t exactly damage concrete, the concrete could wreck your blade especially if it is a softer one. So take it easy and slide the blade across the concrete in quick smooth strokes at an angle. Use firm motions similar to if you were using a whetstone. Look out for smoother concrete though. It gives better results. The iron on iron method is another time tested one often used by mothers and chefs for quick and easy sharpening. All you need to pull this one off is two knives. Just make sure one knife has a harder blade than the other. Quick brushes of knives against each other will have your blades honed to razor sharpness in no time. There is a technique for this method though. You just don’t get to slashing. First off, move your face out of the knives range. Your face won’t get sharpened by getting close, you will only end up looking like a wild cat attack survivor. Hold both knives in front of you with the hard bladed one in your right-hand spine out. Now run the lighter blade’s sharp edge across the spine of the hard blade in quick motions similar to when using concrete to sharpen. Alternate sides till both blades are razor sharp.